This Sunday we’ll be reading James 1:9-12. We idolize the wealthy in our society. People are famous and have reality shows who have never, EVER done anything of value for our world; they are famous simply because they are rich. We make them celebrities and envy them and fantasize what it would be like to be in their shoes. But all through the Scriptures, both Old and New testaments, we are presented with a different view of the wealthy. From the very opening of his letter, James has been presenting us a very unusual perspective on life. He encourages joy during difficult times. He announces that wisdom isn’t something gained purely through life experiences, but that it is given as a gift by God. In this section, he turns the world on its head again. How does this passage compare to the world’s perception of wealth? How do you think the “lowly” person is exalted? 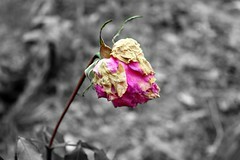 How is a rich person like a withering flower? Considering the description James gives of wealth in v11, how does this challenge our understanding about what will bring us security and happiness? V12 provides the ultimate contrast. If you were to summarize what he’s saying, what is the basis for a sense of security and joy? I have been in situations before where I had no way to pay my way out of something. Mortgage, car repair, a new car, dinner, etc. But Matthew chapter 6 says “but seek first the kingdom of God and His righteousness, and all these things shall be added to you.” Meaning food, clothing, and shelter. Then God shows out the way he does and provides all of my needs for free. He freely gives, that’s what He does, who He is. I’m not advocating to sit on you rump and just say, “the Lord knows I hath need of these things.” I exalt in the lord at that moment. I praise Him for all that He is. As far as the rich man goes. I think we can get ourselves into a bad mindset by hating the rich. There were many rich men in the Bible. Abraham, Solomon, Joseph, Job, etc. Religion has completely skewed the meaning of prosperity though. Many times in the Old testament it meant “to wisely understand, or to be prudent.” We who trust in our money often find ourselves using our finances to get out of our problems. But not many problems can be solved with money. When money fails and the “heat is on” all of their hopes and everything they’ve trusted in “withers” away. Money is temporary. Power is an illusion. But God and His ability and faithfulness to provide is truly eternal. Wealth is fleeting, only Goods love lasts. Withstanding our trials faithfully will bring us happiness. That is how to live a wealthy life.